7 Reasons Cancers Make The Best Lovers. 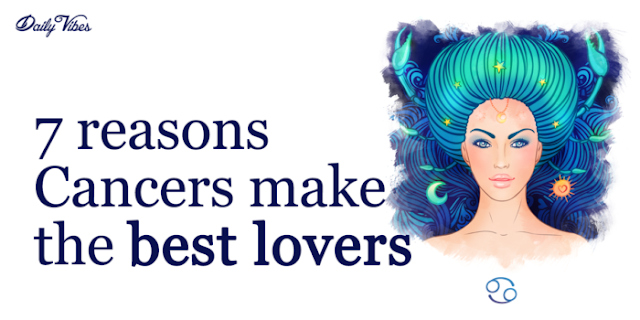 Cancers are known to be loving and dedicated relatives and friends, but did you know that they can make the best lovers out of the whole Zodiac? Cancers are natural nurturers but they can also be the best romantic partners for many reasons. Here are 7 reasons Cancers are amazing lovers. 1. They’re insightful and profound. Cancers are smart and skillful in observation. They see things that usually go unnoticed and they know how to read between the lines. They are able to pick up on the smallest details, whether it be an inner struggle you’re going through or emotions you’re not sure how to deal with, and they know just how to help you through it. The Cancer has an innate sense of leadership. They are charismatic and confident and others find this very comforting. Cancers are able to provide a warm, guiding presence to those who feel lost, sad or broken. This may be why people who have been through great struggle or pain are drawn to them. When you feel like you can’t stand anymore, you don’t know where to turn or what to do next, your Cancer loved one will be a lighthouse in the storm. 3. They know the value of personal space. While Cancers are very committed to their person and love to be as close as possible with them most of the time, they also understand the importance of having a little time to yourself. This solitude may be in small doses but it is necessary for anyone, even the extremely intimate Cancer and their partner, to experience. It allows for introspection, to find and center yourself and recuperate mentally and emotionally. 4. They’re resourceful and imaginative. Cancers are emotional beings and therefore tend to also be very creative. They know how to use an active imagination to think up new ways of showing their love and affection. They want to keep things interesting and exciting for the person they’re with. This makes for a thrilling romance that will stand the test of time. 5. They are incredibly empathetic. Cancers are very deep feelers. They are highly sensitive and emotional, but also uniquely intuitive of others’ feelings. The feelings they experience can be very intense but they won’t take this out on those around them. They would rather try to deal with the stress on their own than possibly hurt the people they care about. For this reason you should make sure to check in with your Cancer on a regular basis. Ask them how they’re doing, if they’re okay or if they need help with anything. They won’t come to you unprovoked with their struggles, but they will be honest (and grateful) if you ask. 6. They’re as loyal as it gets. Cancers are strong and they can handle a lot of wear and tear without breaking. Once they know how they feel about someone, or are sure that they’ve fallen for you, you’ve got a lifelong connection. No matter what happens or how bad things get, they will stay by your side until the very end, even if it has to be just as a friend. Unfortunately sometimes this quality means they get taken advantage of, so don’t be that person. Don’t take this deep loyalty for granted, it is a rare thing to find elsewhere. 7. They’re built for love. The Cancer is the one sign truly made to love and be loved. Their purpose and drive in life is to make and spread love. Kindness, patience, warmth, devotion and intimacy all come easily and naturally to them. They bring out the best in those closest to them and they genuinely want to know everything about you, they want to share their life with the one they love more than anything. You will always be a priority and a joy to them, never a burden or ball and chain. Love is always wonderful, but being in love with a Cancer is an especially beautiful experience. Remember to be gentle with their heart and always be honest with them. If you can do this, you’ve got an amazing relationship in the making!